Elephant trekking in Koh Chang is possible at 6 separate camps located either roadside or inland in Klong Son, Klong Prao and Kai Bae Beach on the west coast. These camps, which house 8 to 10 animals each, offer sessions of either 1 hour, 850bt per person or 2 hours, 1,300bt per person. For the 1 hour session, you ride in a chair on the elephant’s back over a short trek through the jungle and forest. The 2 hour session starts with this before heading to a local river, where you can swim with the animal. Children under 10 are 500bt and 650bt respectively, under 3 are free. Water, fruit and a drink are also provided. Times are standard across the camps at 09.00am, 11.00am, 13.00 and 15.00. Transfers from your resort are included, provided the resort is not beyond Bailan Beach and not down the east coast. Times for collection range from 10 minutes to an hour before the above times depending on resort location. They drop you back afterwards. 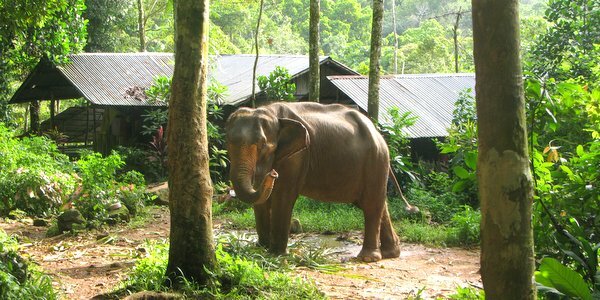 The Koh Chang elephant camps are not elephant sanctuaries as you can find down in Petchaburi at Elephant Refuge or up in Chiang Mai at Elephant Nature Park. At those spots, the huge amount of land allows the animals to roam freely and the focus is on rehabilitation and visitor education. Koh Chang simply does not have the space for that, so you might describe the island’s camps as much scaled back versions of Elephants World near Kanchanaburi – see the tripadvisor reviews on these places to get the fuller picture. On Koh Chang, the elephants are undoubtedly well kept and looked after but the reality is these are animals are working for you as tourists. To enable that work to happen safely, the camps use several procedures which are often highlighted as prime examples of the camps’ unethicality. Firstly, the elephants are chained on one ankle whilst standing about in camp to prevent them from dangerously wandering off. Secondly, during the rides, the tourist sits in a wooden seat attached to the animal’s back. 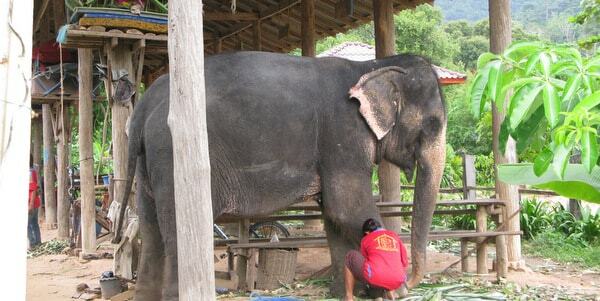 Thirdly, the mahouts do use elephant goads (bullhooks) to control the animals. The flipside to the above is were the elephants not working, it is highly questionable they would in fact still be alive. There is no magic solution whereby the animals can be shifted off en masse to sanactuaries – as far from ideal as the existing set-up is, it does, at the very least, provide the elephants a home at which they are fed and cared for. Similarly, visiting the camps allows you to see these magnificent beasts up close, which can be a hugely positive experience for both children and adults alike. Indeed, this proximity to the elephants, in turn, may foster an understanding which guides the individual’s future thinking to a much more conservational approach. 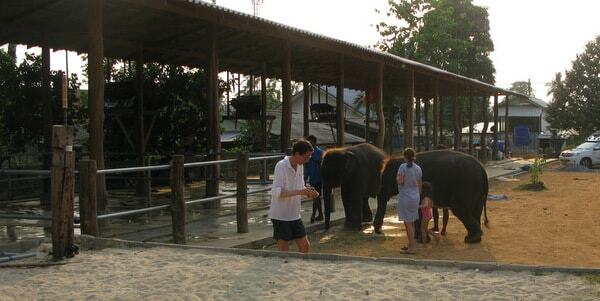 Ultimately, of course, it is your choice as whether or not you visit the Koh Chang elephant camps. If you do wish to visit, please Contact Us so we can organise this for you. We only use our trusted recommendation, Ban Kwan Chang. In your enquiry, please state the date, preferred time (with 2nd time as an alternative), number of people, adults and/or children, resort name. Payment is direct on the day in THB cash only. Located just before the end of the inland road, a very natural feeling camp with 10 elephants - former workers and entertainers, now retired. Treks are into the nearby forest, with about 45 minutes aboard, 30 minutes for the bathing if you take the 2 hour option. Associated with the Asian Elephant Foundation. 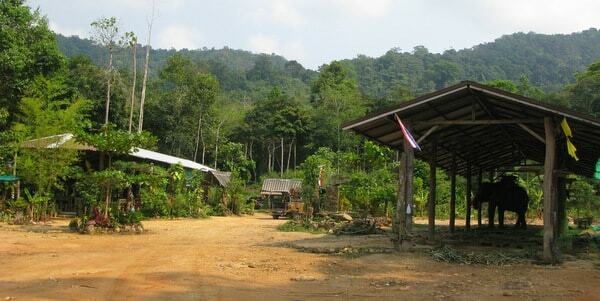 Down a long, muddy track deep into the valley at Klong Prao, another nice natural and isolated camp. Friends of the Asian Elephant Foundation (FAE), with treks through the fields, orchards and rubber trees and swimming in the river. Cafe on site. Small, friendly camp at the start of the road to the main Klong Plu Waterfall, Treks up the hill into the the nearby forest and swimming in the lake and river. Washing the elephants at end of session too. Located just back from the road with treks into the interior area behind the camp and swimming in the river along the way. Long established, with elephants visible from the road. Large, well-run outfit with treks into the fields behind the camp. Does include some time walking along the main road as you head down the dry river bed. Chance to swim with animals too. Coffee shop. Small friendly camp on the back road leading to the interior and treks in the forest round and about Kai Bae. Friendly mahouts, lots of chance to get up close. Normally take their baby elephants to the beach in the evenings.